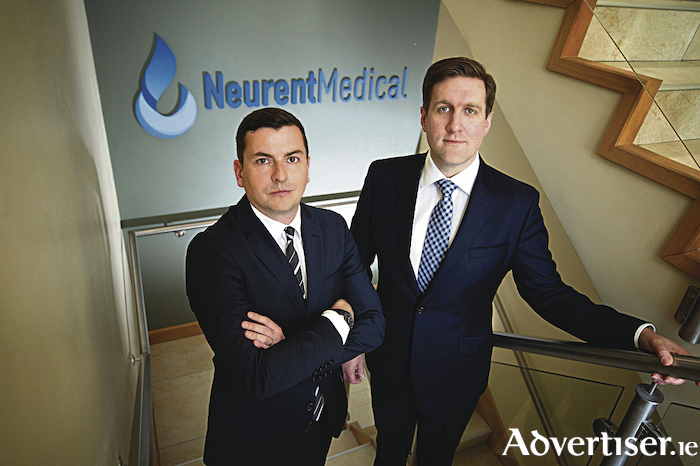 Neurent Medical Limited, a Galway-based medical device company specialising in the treatment of rhinitis, an inflammatory disease of the nose, has raised €9.3 million in a Series A funding round. The company was previously established by Brian Shields and David Townley who met through NUI Galway’s BioInnovate Ireland Programme. Neurent Medical Ltd is a medical device company specialising in the Ear Nose and Throat (ENT ) market. The company designs and develops products for treating inflammatory diseases of the nasal cavities. The initial product offering reduces the primary symptoms of rhinitis, congestion and rhinorrhoea. This funding will be used to advance product development, carry out clinical trials and prepare for US commercialisation of the device and will also create up to 25 new positions in the company. Neurent Medical Chief Executive, Brian Shields, said the funding will help us to advance their product development and ultimately get their technology in the hands of Ear Nose and Throat surgeons. “Fountain Healthcare Partners, along with other members of our investment syndicate, bring huge experience to Neurent Medical and have a proven track record in the industry. We would also like to take the opportunity to thank Enterprise Ireland for their continued support over the past number of years,” he said. During the clinical immersion phase of the BioInnovate Ireland programme, Brian Shields and David Townley spent time with clinicians, nationally and internationally, including NUI Galway’s Professor Ivan Keogh in the Ear Nose and Throat clinics. During this time, they invented a novel device solution to address a large unmet clinical need they observed. In collaboration with Professor Keogh, Professor Peter Dockery, the University’s Chair of Anatomy and Dr Martin O’Halloran from the University’s Translational Medical Device Lab, they carried out early validation of their technology concepts with commercialisation funding from Enterprise Ireland. Dr Faisal Sharif, Director of BioInnovate Ireland in NUI Galway, said they are delighted to see Neurent Medical funded for €9.3 million. “This is a significant achievement which will enable them to commercialise their clinical device for rhinitis. BioInnovate Ireland supports fellows to identify unmet needs in different clinical areas through a dedicated fellowship programme which was co-funded by Enterprise Ireland. The success of Neurent Medical signifies the importance of identifying such unmet clinical needs,” he said. Rhinitis is an inflammatory disease of the nose and is reported to affect up to 40% of the population, 25% suffering from allergic rhinitis and 15% from non-allergic rhinitis. It is the fifth most common chronic disease in the US and the most common chronic disease in children overall. Rhinitis is associated with direct healthcare costs of up to $15 billion per year in the US, and has a proven major impact on quality of life, cognitive function and decision-making. The illness is associated with decreased work productivity and absenteeism.The novel therapy being developed by Neurent Medical will offer allergic and non-allergic rhinitis patients an alternative, minimally invasive, and more readily accessible treatment to alleviate the two primary symptoms of rhinitis, rhinorrhoea and nasal obstruction. The therapy will enable Ear Nose and Throat surgeons to treat rhinitis patients in an Ear Nose and Throat office setting using only local anaesthesia, removing the complications and costs associated with existing surgical procedures. David Townley, Neurent Medical Chief Technology Officer csaid they are excited that the latest investment provides an opportunity to expand internal teams working across both primary and applied research.